Parking.com has convenient parking for the Fisherman's Wharf in San Francisco. Click on a location name for parking information, including rates, hours of operation, and entrances. 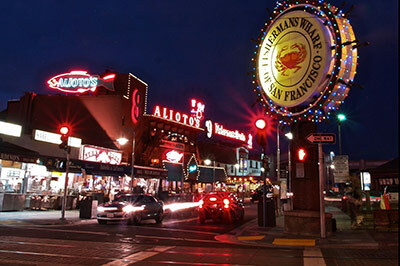 Fisherman's Wharf is a tourist destination onto itself. It also is the location for such popular Attractions as Pier 39, the Cannery Shopping Center, Ghirardelli Square, a Ripley's Believe it or Not museum, the Musée Mécanique, Wax Museum at Fisherman's Wharf, and the San Francisco Maritime National Historical Park. This area is a popular viewing location for the sea lion colony next to Pier 39. Fisherman's Wharf is known for its seafood restaurants which serve fresh seafood, and local specialties like Dungeness crab and clam chowder. Some of the restaurants including Forbes Island, Fishermen's Grotto, Pompei's Grotto, Alioto's, Franciscan Crab, Joe's Crab Shack and Bubba Gump Shrimp Co.
For additional information, please visit the official site.